Leverkusen - While a new-look Bayer 04 Leverkusen side began the 2013/14 season impressively, beating SC Freiburg 3-1, their first goal of the new campaign came from a familiar boot, that of Stefan Kießling. After rippling the net 25 times in 2012/13 to finish as Bundesliga top scorer, the 29-year-old wasted little time in picking up where he left off, breaking the deadlock in the 22nd minute. Speaking after the final whistle, the forward analysed the game and gave his thoughts on the club's promsing attacking trio. Stefan Kießling: Really? Is that a club record? I didn’t know that, but that’s great! I certainly wouldn’t mind it carrying on. Question: How did your first goal of the season feel? Kießling: It was a relief, because it made it 1-0 and allowed us to settle. It did us good. Question: And are you pleased with result? 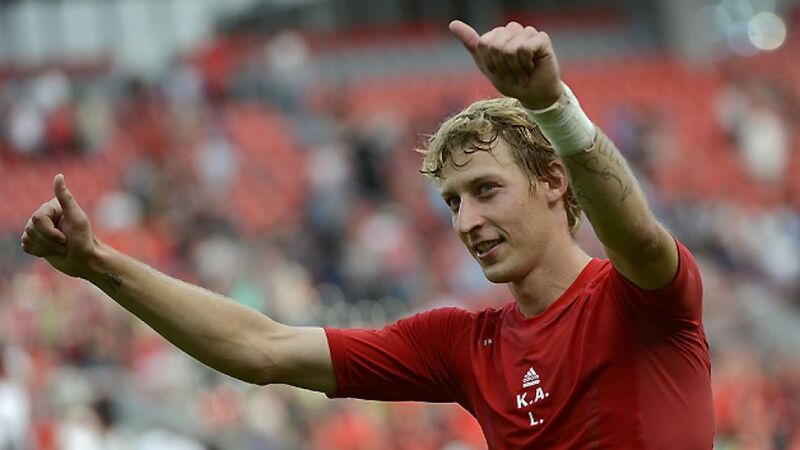 Kießling: I think we can be very happy with it. Apart from ten minutes in the first half, the performance was solid; we gave nothing away apart from one silly goal. It was a perfect start. We were also motivated by the fans standing on the new terrace behind the goal. We took it upon ourselves to win for them, and as a result we played well and deserved the victory. Question: The link-up play between Sidney Sam and Heung Min Son worked well - is that something we can look forward to? Kießling:(Laughing) Hey, they’re not playing on their own up there! They've obviously got a distinctive style: they play quickly and finish moves well. We need that. Kießling: No, I didn’t hear that, but I wasn’t looking at the crowd on the new terrace or their reaction. If it was something serious, then you’d certainly have a look, but this was nothing. Question: Did you feel the burden was a bit lighter having Son and Sam in the attack with you? Kießling: I’ve got to look at the data to see how much ground I covered. I feel exactly the same as last year, and the system certainly worked well then. I enjoy having two or three players behind me who can spread the play. Question: We’ve already discussed your new record. You've got the opportunity to extend it in the next game against VfB Stuttgart, against whom you almost always seem to score. What are your thoughts looking ahead? Kießling: When statistics like that and the record are brought up so often, you’ve got to be careful and can’t get complacent. That’s for next week, and I always let what happens next week come as a surprise.